I actually had a funny feeling about it, and had intended to search for them first thing this morning.....it was when I saw Amara out of the nest and looking a bit disorientated that I felt there may be some urgency so I broke open the wall section and found them. I will check them again later when Cheeta gets here and try and get a photo. I can take photos when the Mums are out feeding around 4:30ish. ****Happy to report*****The babies that were cold and unfed are now pink, wriggling and happily fed by foster mum Spice. So far so good. when you save chicks like that. Well here's the photo of Spice with a nest full of unexpected babies. She has one of her own. I put four babies and a couple of eggs in there belonging to Amara so that makes 5 babies. BUT this afternoon another baby hatched so Spice now has 6 babies in there and only one is hers. She seems as pleased as punch about it all too. All babies are healthy, happy and being fed. Please excuse the messy nestbox as it has been raining and things got a bit mucky in there rather suddenly. Will clean tomorrow as I check all is well. ** A new baby born today to Princess and Prince. Princess is not a very good mother and this newborn was unfed with the cold night closing in and Princess nowhere near the nest. This baby has been put in Swifts nest to raise. Great news! Glad she is being a good adoptive mommy! WOOHOO I'm glad they are all going well. Good little Spice. All of the babies is Spice's nest (5 adopted babies of Amara's and 1 of her own) are doing well. A new baby today in the nest of Pickles and Tart. But Tart is fostering eggs. Until I check the mark on her discarded eggshell, I wont know who's has hatched. Hers or Kermits. The huge babies in the nest of Slinky and Bloo are colouring up nicely. 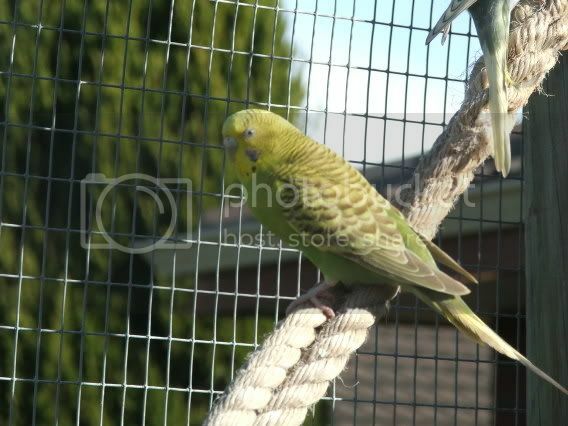 One that has pin feathers is a definite spangle, two others look normals, other two yet to feather. Cheeta can check those for me and give you a rundown on the genetics side of things. 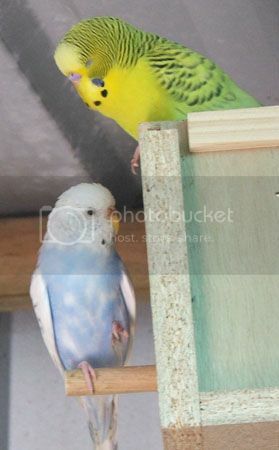 :budgiedance: A baby in the nest of Butter (creamino) and Chucky (dom pied) seems to be all yellow so far, dark eyes. Another cinnamon baby in Izzy's nest, two others yet to determine. Ciara has seven babies, interesting colours there. 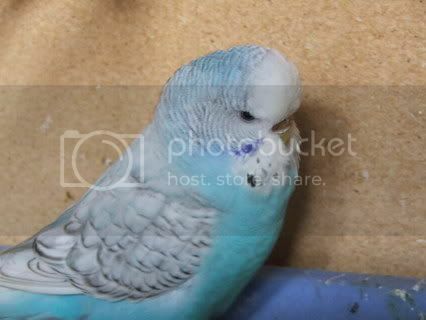 I will be doing a large batch of photos through the week towards the end of the week as feathers start to show colours. either way I get confused :(Laughing out loud): but it is fun to read. I don't always reply, but I look forward to reading the updates a couple of times a day. My internet is still not workng.... on my computer that is, so im on my moms. How are you all...? 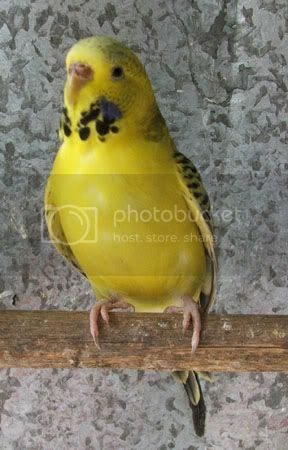 Karen thats great about all the birds!!! Poor Amara But YAYAYAYAYAYAYAYAY SPICE!!! 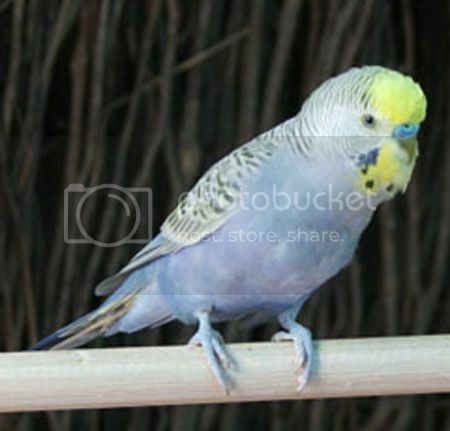 :bluebudgie: Look how many tini babies are there :ausb: What a crazy nest full of adorable babies! Karen- My msn will be working soon... I miss our lil convos. And i almost died guys! 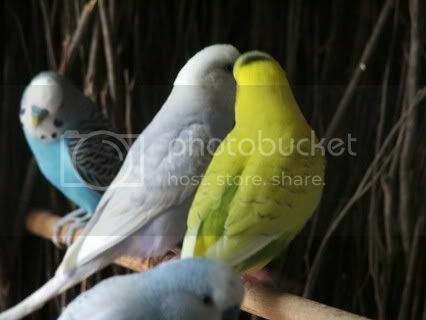 I have not talked to anyone about budgies in over 5 days! Im dying!!!!!!!!!!!!!!!!!!!!! Anyways, i love the birds Kaz How are they diong now? Interestingly enough we have a few albinos in nests right now. Casper (YF2 cobalt normal) and Cookie have two albinos amongst their four hatched babies. Casper fathered an albino baby with Spook before (Sugar is her name), and now another two which obviously means Casper carries the ino gene. 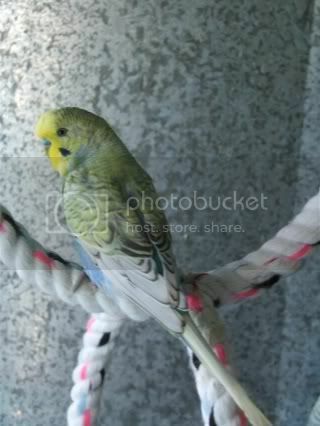 Sugar Other ino babies are in the nests of Laila/Curry, Swift/ Rocket and one other as I recall. Spot and Precious lost 3 of their five babies through the night, seemingly from the cold. One more baby from Spice's nest died too. She now has 1 of hers and 3 of Amaras. Kaya and Sonny have their four babies plus one adopted from Kaya's sister Izzy....Babies seems to be 3 cinnamon greens, 1 sky or cobalt spangle, and a yellowface cobalt. Slinky and Bloo's babies seem to be maybe a sky normal, a grey? 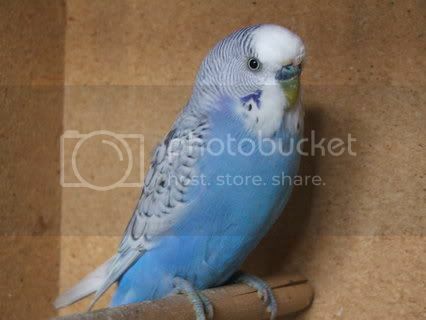 normal, a sky opaline spangle, a YF cobalt and ? another. Swift and Rocket have a yellow recessive pied, a lutino and unsure of others, plus one adopted baby from Princess (who is not a good mother). 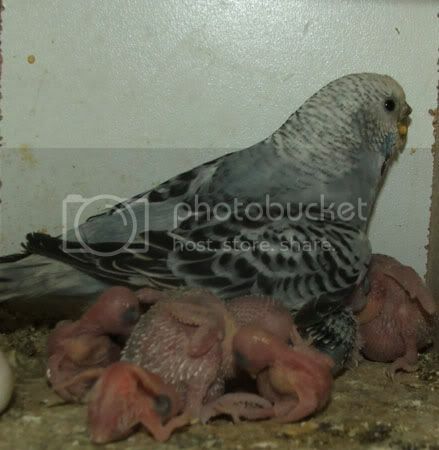 Ciara has two very white babies, looking eithwer rec pied spangle and dom pied ? plus others. 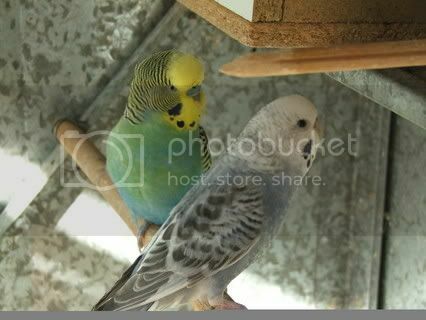 Curry and Laila's 6 babies all have yellow feathers so far it seems....one is a red eyed albino (lutino?). Will try for better photos later in the week.